The fourth Alabama (SSBN-731) was laid down on 14 October 1980 at Groton, Conn., by the Electric Boat Division of the General Dynamics Corp.; launched on 19 May 1984; sponsored by Mrs. Barbara E. Dickinson; and commissioned at the Submarine Base, New London, on 25 May 1985, Capt. Wade H. Taylor (Blue Crew) and Capt. Malcolm S. Wright (Gold Crew) in command. The nuclear-powered fleet ballistic missile submarine (FBM) departed the Connecticut coast three days later to conduct her shakedown cruise off the coast of Florida. The Blue Crew completed its shakedown training late in July, and the warship stopped at Port Canaveral, Fla., on the 22d for the Gold Crew to take over for its cruise. At the conclusion of the Gold Crew's shakedown training late in October, the Blue Crew came on board again at New London on the 20th to take Alabama back to the yard at Electric Boat for post-shakedown availability. Those repairs occupied the warship until mid-December when she completed sea trials in Narragansett Bay. Alabama enjoyed a brief holiday standdown from 22 to 31 December and then got underway on New Year's Day 1986 for sound trials in the Bahamas. She completed that assignment on 30 January and shaped a course for her namesake state. The ballistic missile submarine visited Mobile, Ala., between 2 and 11 February before heading for the Panama Canal. She passed through the canal on the 17th and arrived in Bangor, Wash., on 6 March. The warship remained at Bangor, where she exchanged crews, until 13 April when she put to sea for independent ship's exercises. Alabama operated out of Bangor until mid-May when she embarked upon her first deterrent patrol. 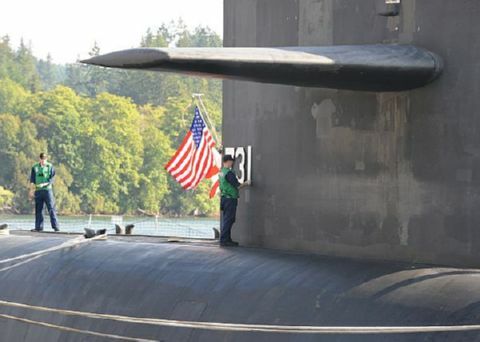 Operating from the Pacific Northwest, the ballistic missile submarine carried out four deterrent patrols during the last seven months of 1986. As of the beginning of 1987, however, she was undergoing refit at Pearl Harbor, Hawaii.